Stjepan was the last Bosnian king. He was captured by treachery (the name of the traitor is still remembered in Bosnia) and decapitated by Turks in his Royal city of Jajce. His daughter and son were taken in slavery to Istanbul's court and there forced to convert to Islam. 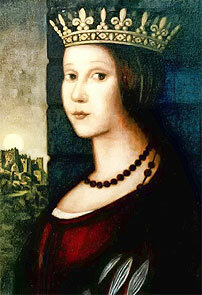 Stjepan's wife was Katarina Vukcic-Kosaca (1424-1478), the last Queen of Bosnia, and an ardent Catholic. She is still one of the most beloved personalities among the Croats living in Bosnia. When Bosnia fell under Ottoman rule in 1463, Katarina lost her husband and both children. With the help of some Bosnian nobles, she managed to escape to Dubrovnik, and then to Rome, where she had been deeply involved in the humanitarian activity of the Franciscan community (Aracoeli) becoming Franciscan Tertiary herself, to help the Bosnian Croats under the Turkish rule. She built a church of St Katarina in the picturesque Bosnian city of Jajce (which unfortunately was destroyed by the Serbs in 1993). Despite her very difficult position, she had always been treated as a Queen of Bosnia in official circles. Tormented by the tragedy of her homeland, the lawful queen bequeathed her Bosnian Kingdom to Pope Sixto IV and the Holly See in 1478 ("...in case that my Islamised children are not freed and returned to Catholic faith"). The queen is remembered in Bosnia up to the present day as the Black Queen, "black" in the sense of unfortunate or "Sad Queen." Even today all the women, including the very young, from the small town of Kraljeva Sutjeska (King's Canyon) in the area where Stjepan Tomaševich was captured (not far from Sarajevo), cover their hair with black scarves on their heads as a sign of mourning for "Our Queen Katarina," five and-a-half centuries after Katarina's death. Images and text copyright the original author(s). An original feature for the History Files.